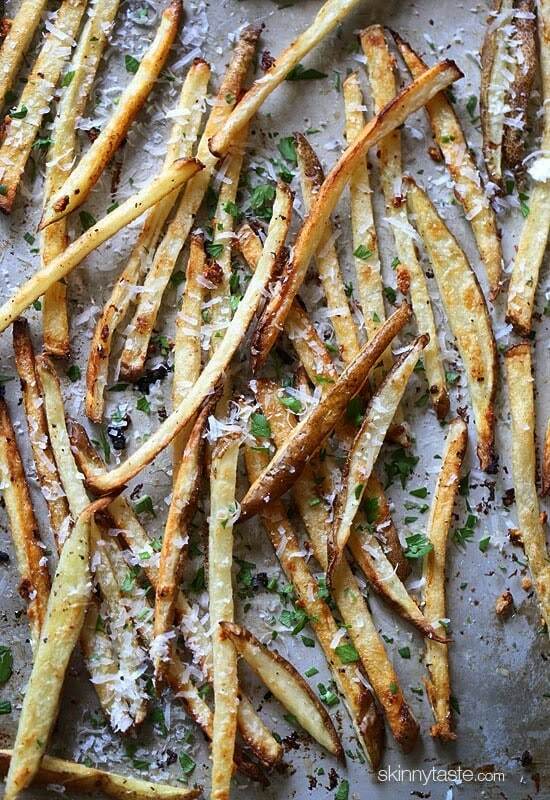 These delicious fries are baked in the oven with garlic, a little olive oil, kosher salt and black pepper, then sprinkled with freshly grated Parmesan and parsley – to die for! Inspired by a night out with friends, my girlfriend ordered something very similar although fully fried and I couldn’t stop eating them – I knew I had to make them at home! Yesterday I set out to see if I can recreate them, and luckily I had a houseful of people who helped me taste test them. BIG HIT with everyone in my house!! You don’t miss the fact that they are not fried at all, and the garlic smells amazing while it’s baking in the oven. I listed them here as 1 serving which is basically one potato per person, but you could share them if you were serving them as a side. I made two batches and baked them on two baking sheets because the key to making them crisp is to make sure they all lay flay on the baking sheet, you don’t want to crowd the pan. To cut them, I used my mandolin and sliced them into 1/4-inch thick slices. Then I took a knife and sliced them into 1/4 inch thin strips. If you cut them thicker you’ll have to adjust the cooking time. Next time I may try my paderno slicer and see how they work out spiralized. And for those of you who are scared of potatoes, I just want to remind you potatoes are good for you! They are rich in fiber, potassium and magnesium, which are all listed as shortfall nutrients in the American diet. Plus, they are naturally gluten free and part of a clean eating diet! Combine the oil and crushed garlic in a small bowl. 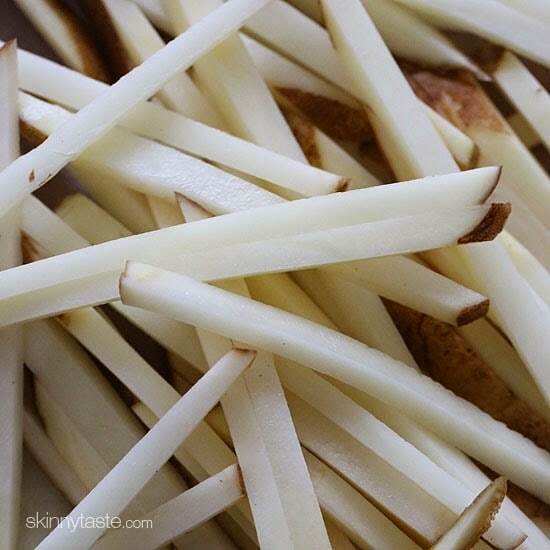 Cut the potato lengthwise into 1/4-inch thick slices; cut each slice into 1/4-inch thick strips. 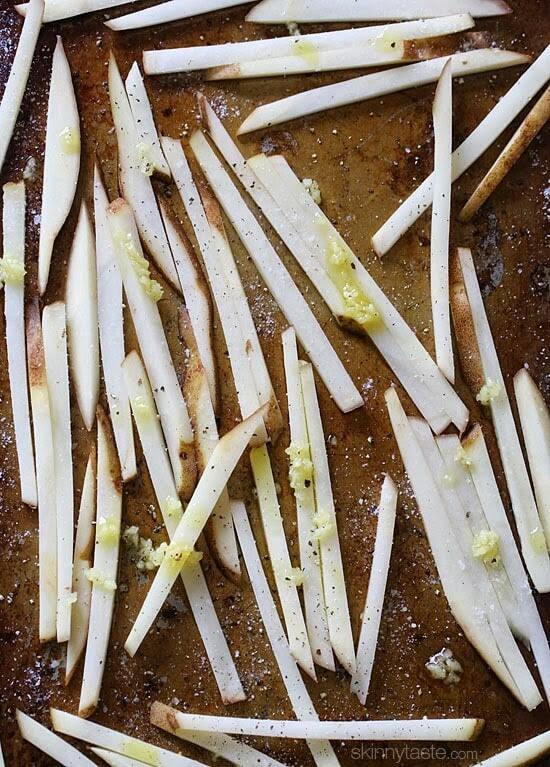 Place on the baking sheet and toss with the oil and garlic and use your hands to evenly coat. Season with salt and black pepper. 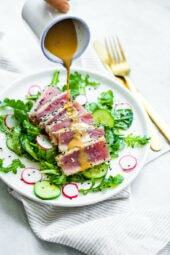 Place on a single layer onto the greased baking sheet. Bake uncovered in the center of the oven until tender crisp and golden brown, about 10 minutes on each side. Baking time will vary depending on your baking sheet and your oven. 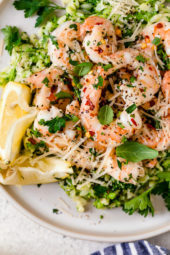 Remove from the oven and top with parmesan and parsley, eat hot! Very good recipe! Be sure to use a single layer! I’ve had these three times in the three days since I found this recipe. I’ll admit I was skeptical because they didn’t involve any soaking, but they’re SOOOOO good! And I can just make them when I want them without having to plan ahead for the dreaded soaking and changing water and what was I thinking before?Thank you for these! And the potato growers of America thank you, too. Better than those drive through ones???? Thanks. Have been making these for quite awhile. Can they also be cooked in an ActivFryer? Whole 6 oz potato is for one person? When we usually bake them, we only eat half a potato bc whole one is 282 calories. It depends on the weight of the potato. This is correct. Thanks! Made them, devoured them! One question: I sliced (4) 6 oz potatoes for 4 people. After baking, each portion was just only about 3 oz. guess they cook down by 1/2. Is that right? One of the reasons people avoid potatoes is because they are a nightshade. Nightshades are vegetables that produce potentially inflammatory compounds (eg solanine, which can worsen joint pain). Just wanted to offer that as a point of information for you and your readers. 🙂 Not everyone is sensitive to solanine, but those who do have joint pain or other inflammatory conditions might want to try cutting out nightshades to see if it helps with symptoms. A tasty alternative to white potatoes is the Hannah Gold Sweet Potatoes! They don't produce solanine. It says ONE serving, not sure where you see 4? I juts made these for my Husband & I and they were a huge hit! Thank you, so very much! I can't wait to try your other recipes! What do you think about refrigerating the pre-sliced, seasoned fries for a day or so & sticking them in the oven right before I;m ready to serve them? These are best eaten right away like all fries. What mandolin do you have or recommend? I need to buy one but there are so many on the market and it's hard to decide…. Made these tonight to go with turkey burgers! Loved them! OMG I made this today & served a small garden salad w/two teaspoons of olive oil & it was the PERFECT lunch & was only about 300 calories! I am not afraid of potatoes especially when they look this amazing. I just heard today that this is national potato month or something like that ha ha. So this recipe is right on time. 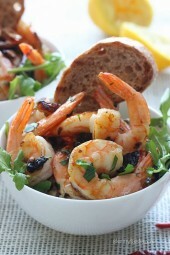 Loving these photos and the GARLIC in this recipe! I made these for dinner as a side with Mushroom Swiss burgers and they were fantastic!!!!! Both my husband and I's new favorite fry! And so easy and healthy! Thanks so much for the recipe and can't wait for your cookbook to come out! oooh it's amazing what a little salt and herbs can do for something without adding much fat! If you give the potatoes a 10 minute ice bath and then dry them completely before baking them they get extra crispy! Eating these now. Delicious! I have a Boenner mandolin. Love it! I used my Tupperware mandolin to slice into fries and it worked perfectly! The fries were so yummy! Gina, did you crush the garlic or put it through a garlic press? The photo looks like you used the garlic press. This recipe does sound delicious, well worth making. I tried this recipe last night. The fries were crispy and delicious. They had just the right blend of spices and flavour. You ever try using non stick foil… maybe good for these! They look AMAZING! Yummy! Will try with truffle oil. Well, I tried to reply and not sure it worked so I'll try again. I used the same ingredients but swapped the potato for a turnip. Delish. Thanks for the tip using turnips…I also wonder if a jicama would work? Gina, I recently tried this spiralized! I made "curly fries" (garlic and onion powder and tossed in olive oil and baked) and they were SO GOOD! Crispy, flavorful, and really fun to eat! My hubby (who is a big curly fry fan) loved them! I used the thicker blade of the spiralizer. I would love to hear how these come out spiralized! I do have a mandolin, but curly fries are just more fun somehow, aren't they? Let us know if you get a chance to try them spiral cut, please. We've been making a version of these based on your Lomo Saltado recipe for weeks now. My husband requests them a lot. If my fries get too big, I do more like 15 min, flip, then 15 more minutes at 425 degrees (but that's my problem with cutting). They are crispy and salty and wonderful. Never made fries before at home but we do now! These look amazing and sound so full of flavor! 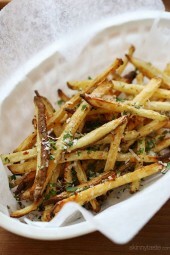 And what's better than SKINNY fries! I used to do this, then I learned one extra tip. After you take them out of the oven, toss them with the garlic and olive oil again THEN do the parmesan and parsley! YUMMY!